Tourists get a great opportunity to snap a picture of two dusky dolphins on a tour with Encounter Kaikoura in New Zealand. A dolphin watching tour with Encounter Kaikoura on the South Island of New Zealand is an excellent way to capture a picture or two of the Dusky Dolphins. Kaikoura, New Zealand is blessed by having a variety of marine mammals in the area but the Dusky Dolphins and the Sperm Whales are the most commonly seen. In the Kaikoura region, the Dusky Dolphins appear year round with a slight variation in the summer and winter movements and habits. In the summer months from October to April, you will find the Dusky Dolphins closer to the inshore waters where you can get an outstanding picture of these cute marine mammals. Dusky Dolphins love to leap clear out of the water and are considered to be amongst the most acrobatic of the dolphin species. 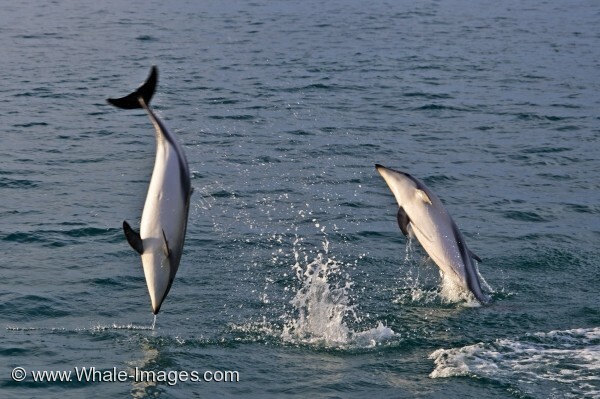 This is just a small example of what you will see the Dusky Dolphins do on your Encounter Kaikoura boat trip. Encounter Dolphins in New Zealand is a trip of a lifetime where you can watch and snap a picture of the Dusky Dolphins or enjoy a unique experience and swim with them. To see the Dusky Dolphins perform leaps, jumps, side slaps and back flips in their natural environment is a fascinating experience.